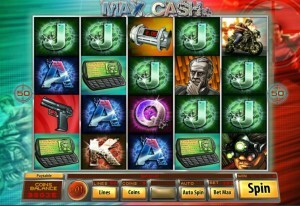 Max Cash appears to be a spy themed slot machine, where Saucify tells you about the adventures and missions of a super agent called Max Cash. The game looks the part when it comes to its spy theme, having all sorts of gadgets that display the mission objectives, handguns, bombs with countdown timers and so on. It’s not an unusual theme, but Saucify did a decent job with it. 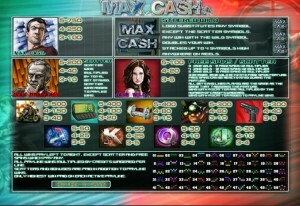 Max Cash has 5 reels, 50 lines and it can give you payouts of up to $5,000. The features include wilds that come in stacked, scatters, multipliers and free spins. The feature list of Max Cash is by no means poor, including the stacked wild, the scatter with free spins and multipliers, plus another scatter that only gives out prizes. Let’s start with the Max Cash Logo, the stacked wild of the game. The stacked part basically means that it arrives in groups of up to four symbols, capable of taking over an entire reel if you’re lucky. Just as easily it might appear only with one visible symbol out of the four. The average will probably be at about 2 or 3 visible wild symbols on the reel. Whenever the wild manages to help out, by substituting for another symbol, the combination formed with its help will benefit from a 2x multiplier, which will double the prize. The scatter symbol which only offers cash prizes is the next one we’re going to take a look at. The image of a man called Man Dracanca is used to represent it. This scatter symbol has only one role here, to give you a prize if you have enough of these symbols in place. The exact place doesn’t matter, only that you have them all on the reels at the same time. The rewards offered will vary from 10 to 200 times the total bet, for three to five symbols. The second scatter symbol shows you Jane Wild. It will also pay based on the number of symbols present, between 5x and 100x the wager, but it also triggers the free spins, all of them having 2x multipliers. You win 9 spins when three Jane Wild scatters are in place, 12 when there are four, and 15 spins when all five are present. You can reactivate the free spins as you’re playing through your current batch. Placing a bet on the 50 lines of Max Cash requires that you first decide how many of them you want active and then how many coins will be used in each case (1 to 5 coins per line). The denomination of a coin is between $0.01 and $0.10, which means that the line bet is $0.50 at most, while the total bet is $25. The best rewards come from the scatter symbols, the better one offering 200x the bet as a top prize. That’s a top payout of $5,000 which could be yours. The game shows in the background two action scenes in which Max Cash is involved. The right half is red and shows him jumping out of an airplane, while the left half is green and you see him on a motorcycle. The reels are in the centre of the screen and they are occupied by agent or mission themed symbols on one hand, and by poker cards with explosion like effects behind them. 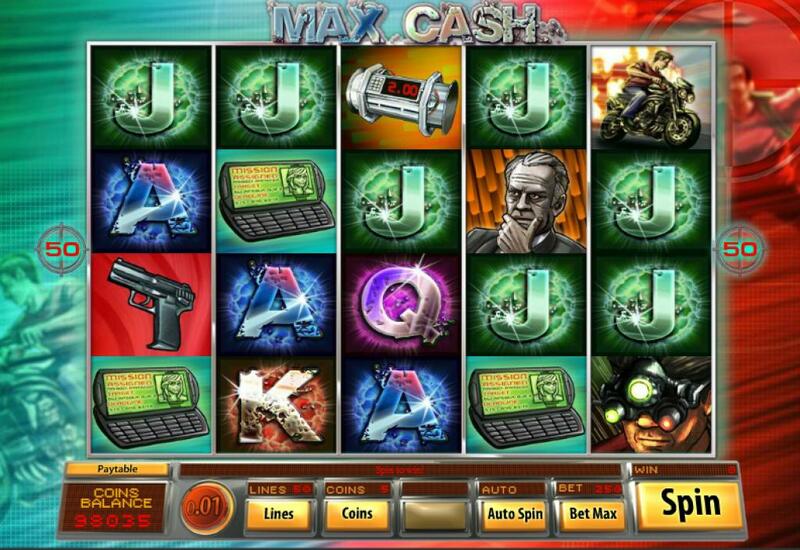 Symbols: Max Cash Logo (wild), Man Dracanca (200x the bet, scatter), Jane Wild (100x the bet, scatter), Max Cash (750x), Max on Bike (500x), QWERTY Phone (400x), Bomb (400x), Max with mask (300x), Handgun (300x), Ace (50x), King (50x), Queen (30x) and Jack (30x). The spy theme makes it a favorite for a lot of people, and the features give considerable help in making it a great slot machine. The Max Cash slot machine is offered through the Saucify platform, so if you want to play it for real or just to practice, look out for casinos that use it.